Termites in Brisbane, they are well developed and destructive. Termite cause massive amounts of damage to homes and buildings across South East Queensland including Brisbane. If you have located termites, leave them alone and call us now – 1300 55 22 34. Termites are unpredictable, sneaky and damaging, they leave a large hole in your bank balance. We witness Termites destroying homes every day, we also see the emotional side that brings upon the devastation when Brisbane property owners need to refinance the home to rectify the damage. Termites do eat treated timber, “Hardwood Timber” and Cypress pine. 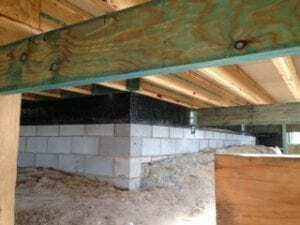 Understanding the construction type is how we decide on the best option for Termite protection as Brisbane’s Suburbs host a range of different types of construction. The old Queenslander home built on steel posts with adequate access beneath the home is a great way to inspect for Termites, however many Queensland homes get built out beneath the undercroft without installing a Termite barrier, becoming the owners worst nightmare. We also deal with new architectural designed homes that are split level which also pose a threat, however making Termite Management top of mind when planning the build will ease the pressure. Did you know ? Steel Frame homes also get attacked by Termites, we understand the property framing maybe steel, however many Steel frame houses have Timber door jambs, windows sills, skirting boards and door architraves that are made of timber and susceptible to termite attack. Termites also eat plasterboard wall linings. Every termite nest located should be identified and eliminated. There isn’t a termite nest found in South East Queensland that should not be eradicated. Many underestimate certain types of Termites as being non destructive, like Microcerotermes which is a big mistake. As compliance is important, we advise the homeowner that all Subterranean Termite nests should be eradicated. The most destructive Subterranean Termites commonly found in Brisbane Queensland are Coptotermes Species & Schedorhinotermes Species that are potential threats to homes. The termite species found mainly in trees (Arboreal Nests) are Microcerotermes and Nasutitermes species these termites are also capable of damaging the timbers in the home including Structural timbers. Buying or selling your home and need a Pre Purchase Inspection Brisbane Simply call us today – 1300 55 22 34.